(Nanowerk Spotlight) Smart watches, fitness trackers, smart garments, smart medical attachments, data gloves – the market for wearable electronics is quickly evolving beyond health care, fitness and wellness into infotainment, and commercial and industrial applications. Wearable electronics consists of several areas: sensors, actuators, electronics and power supply or generation. Whereas the first generation consisted mostly of detachable components, the second generation is moving towards textile-embedded sensors, actuators, and therapeutic solutions (read our previous Nanowerk Spotlight: "Nanotechnology in textiles – the new black"; we have a collection of Spotlights on wearable electronics). One of the key challenges is the requirement to achieve and combine different properties like flexibility, user comfort, and ability for the device to be miniaturized and fashionable. To do this, researchers are making use of different materials like carbon nanotubes, graphene, polymers, and dielectric elastomers and composites. These are tailored to specific application depending on their different characteristic behaviors upon different stimuli. A review article in Advanced Materials ("Significance of Nanomaterials in Wearables: A Review on Wearable Actuators and Sensors"), investigates the contribution of nanomaterials in the field of wearables with a focus on actuators and sensors. The authors discuss current applications of nanomaterials in this field and touch upon the different materials and methods being used. Actuators react to an electrical signal or stimuli generated from a processing unit or a signal directly fetched from a sensor. Such stimuli can be developed by mechanical, thermal, chemical, or magnetic means whereas the reactions can result in structural deformations, force or motion, heating, noise, or even substance release. The development of e-textiles and smart fabrics has broadened the applications of wearable actuators. Contributed to this development have heating elements embedded in wearables; nanocomposite-based therapeutic devices; artificial muscles and muscular actuators; rehabilitation devices; and wearable drug delivery systems. To be incorporated into wearable and flexible electronics, the selection of material is very important. Based on their applications, they should have enough strength, structural rigidity, and flexibility and should be able to provide sufficient amount of actuating force. In addition, they should possess comfort and biocompatibility specially for drug delivery systems and therapeutic systems. However, traditional transducer materials like piezoelectric materials, magnetostrictive materials, and quantum tunneling composites are very hard to integrate into flexible materials due to their poor flexibility. This has led to the exploration of different material groups and the development of novel nanocomposites and other materials including metal nanoparticles, electroactive polymers, conductive polymers, ionic liquids, carbon nanotubes, graphene and shape memory alloys. With this variety of materials and their applications, researchers have followed different fabrication processes as well including electrospinning, spray coating, knitting, weaving, and solution casting. Nanomaterial sensors sense an external stimulus and convert it into a measurable signal, which can later be transferred to a processing unit or a monitoring device. 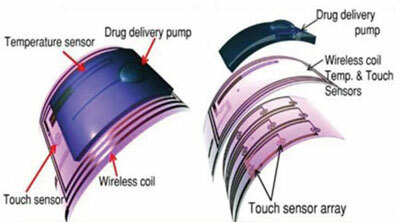 The appearance of sensors in our daily life has revolutionized human?s living quality. Take a modern smartphone: it can precisely fix, aggregate, and display position and orientation for users by integrating many sensors like gyroscope, accelerometer, magnetometer, and barometers in concert. But wearable sensors are expected to be the most practicable and prospective applications in the near future. Wearable devices equipped with a series of simplified sensors such as temperature, strain sensors for posture and body movement, biosensors for disease monitoring, and multifunctional sensors for voice and facial expression detection can feed real-time data to a processing and monitoring central system. Wearable sensors need to be light-weight and flexible, exhibit superior mechanical and thermal performances to prevent them from being damaged, and should be low cost. The low flexibility and consistency of traditional sensor systems based on rigid metal and semiconductor materials makes them largely unsuitable for wearable sensors. Wearable sensors require novel approaches in material and structure design to possess high flexibility, stretchability, sensitivity, and wide sensing range. This led researchers to explore novel nanocomposites and nanomaterials for wearable sensors. 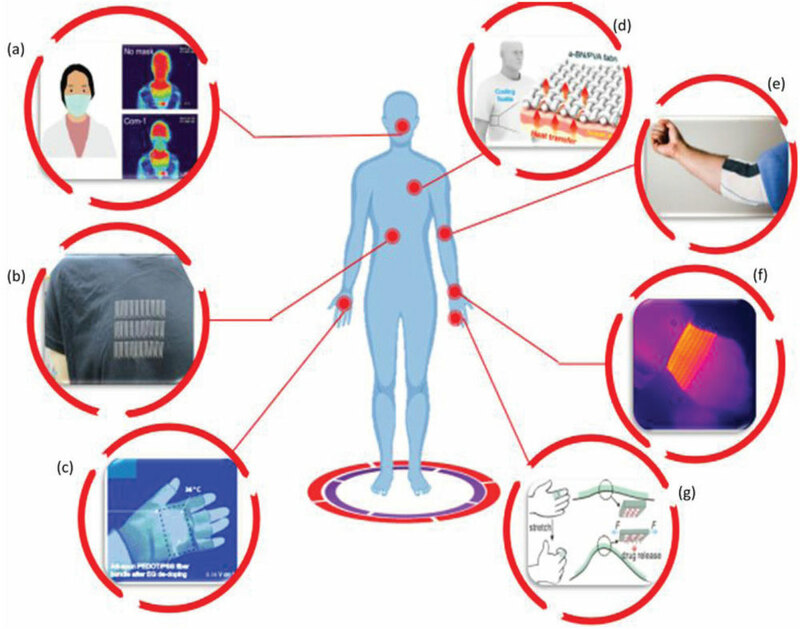 The choice of nanomaterials for wearable sensors mainly considers material properties, processing technology, and the possibility of large-scale production. Specially, 1D nanomaterials and nanocomposites including metallic nanowires and nanofibers are being extensively used. In order to obtain large-scale stretchability of nanomaterials, apart from using all intrinsically stretchable materials, many researchers have adopted advanced structural design strategies to improve system-level deformation behavior, such as wavy structures, horseshoe shapes, filamentary serpentine or fractal structures, and porous structures including sponges and foams. Nanomaterial-based sensors are mainly prepared by incorporating nanomaterials into flexible or elastic substrates such as a fiber, fabric, or polymer matrix. To fabricate wearable nanomaterial-based sensors, researchers predominantly use spin coating, spray coating, drop casting, dip coating, layer-by-layer assembly, vacuum filtration, and direct printing or writing techniques. 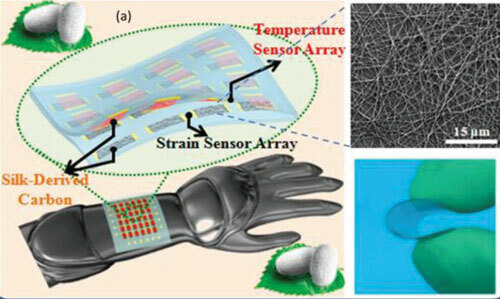 Already, researchers have demonstrated various innovative wearable sensors with excellent performance by synthesizing nanomaterials and nanocomposites incorporating with existing nanomaterials: strain/motion sensors; pressure sensors; temperature sensors; and multifunctional sensors. These wearable sensors can be placed on or embedded in clothes or attached to parts of the body like finger, wrist, arm, throat, chest, and leg. Others can be embedded into wearing accessories such as gloves, watches, earrings, necklaces, brooches, and so on.